Reinvigorate your skin with the BeautyPro THERMOTHERAPY Warming Silver Foil Mask, a self-heating face mask that helps to restore a youthful glow to the complexion. Powered by a nourishing blend of Green Tea and Vitamin C, the treatment works to replenish high levels of moisture to skin, soothing any irritation and balancing the skin tone. 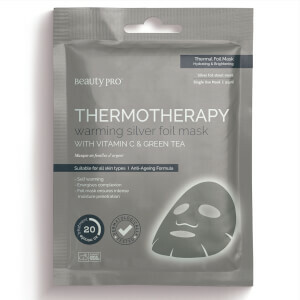 Upon application, the natural body temperature reflects against the foil and creates a warming effect which helps to improve the absorption of ingredients. After use, expect a bright, energised and healthy-looking complexion. Cleanse the skin with water, remove the mask from the packaging, unfold and place on face. Wear for 15-20 minutes, remove mask, there is no need to rinse the skin, excess serum can be applied to neck and décolletage.